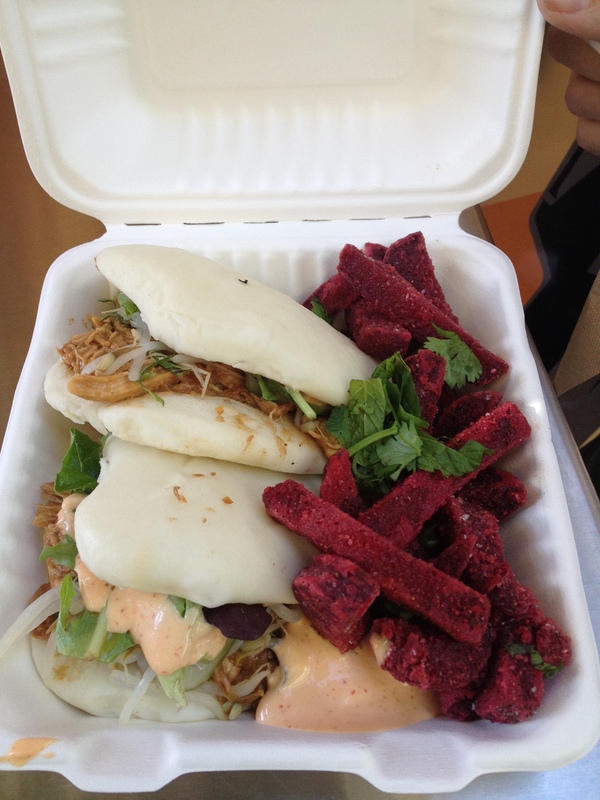 Who is this new food truck and why should you go and try it? As in all restaurants or food trucks the heart and soul of culinary journey starts with the people behind it. I can’t say I know Clement or Steve well yet but I can say that their skills are a great start. Rice, butter, sake, dashi served with a poached egg and spiced pork belly. The great part of learning about new foods and continuing on a culinary side journey is to “go outside of your comfort zone” and try new things…. Case in point, beets are not on my list of wow flavor foods… Sorry beets but honesty is the best policy. Well….. I just may have found a beet that I like! These beet fries are served with steam buns and Bang Bang chicken….with greens. 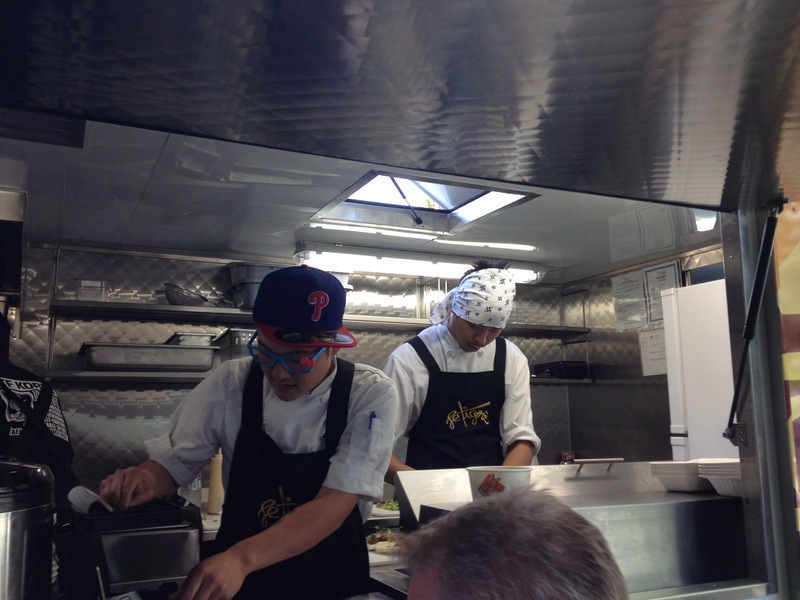 Go see Clement and Steve and tryout their culinary fare….. They are on the corner of Bute and Alberni Street in Vancouver…. They seem friendly and wanting to please…. Stay humble and patient Chefs and your delectable fusion / contemporary Asian fare will sell itself. 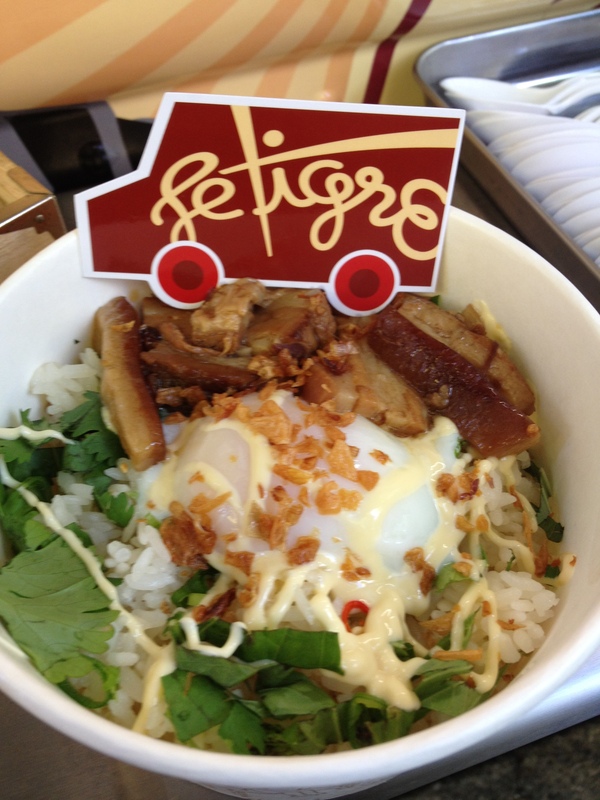 Also keep your eye out for Le Tigre on season 4 of Eat Street! I hear a rumor that they may be on it! 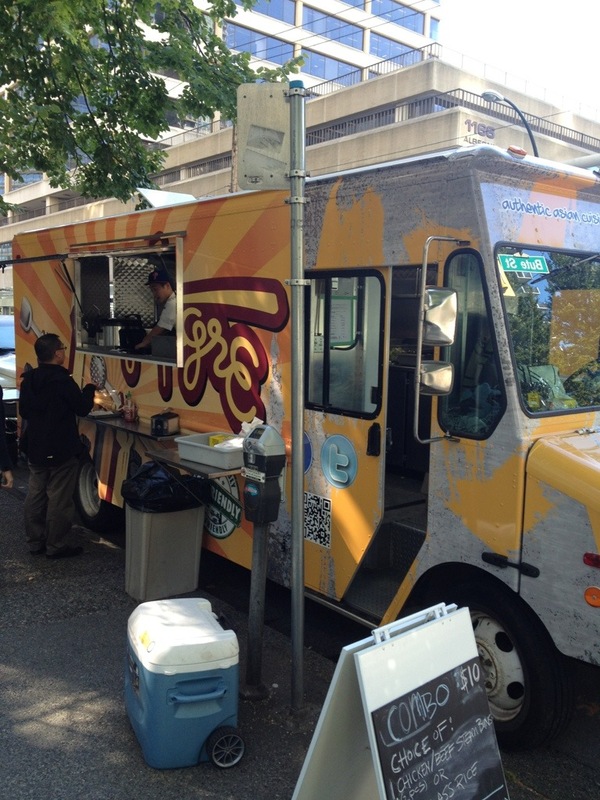 Posted on September 13, 2012, in expand your cultural taste buds, Vancouver street food. Bookmark the permalink. 15 Comments. Beet fried will get me alone – what an idea!!!!! Hello, Neat post. There is a problem along with your site in internet explorer, would test this? IE still is the market leader and a large component of folks will miss your wonderful writing due to this problem. I just looked at it through IE and it was ok. Do you think it may have to do with an outdated IE? I have forwarded your comments to WordPress to have them look into this for me. Thanks for the heads up….. Some issues that you encounter with your WordPress.com blog or account can be solved by changing your browser settings, refreshing the page, or clearing the browser cache and cookies. Note: We recommend that you use either Firefox or Chrome for optimal performance with WordPress.com. Each time you access a web page, your web browser stores a temporary copy of the files needed to display the web page to you. Those temporary files are called the browser cache. If your cache is not updating properly or if it’s stuck, you could be viewing an older version of some of the supporting files that run WordPress.com. Note: It is also possible for your Internet Service Provider to create a cache at the network level. This means that instead of viewing the WordPress.com web servers for some files, the ISP has created a cache to store files on their network to try to reduce bandwidth costs and also to make loading some web pages faster. If a network-side cache is causing you trouble, you most likely just need to wait for it to clear out on its own. If you find yourself getting logged out from WordPress.com frequently and are having trouble posting to your blog, or if you’re having difficulty using the Preview option, it’s possible you don’t have third-party cookies enabled in your browser. Make sure wordpress.com, wp.com and their subdomains (*wordpress.com / *.wp.com) are not blocked by your browser. This also applies to your firewall or anti-virus software settings if you have any. You ought to take part in a contest for one of the greatest sites on the internet. I will highly recommend this web site! There’s certainly a great deal to know about this issue. I love all of the points you made. Having read this I believed it was rather informative. I appreciate you finding the time and effort to put this article together. I once again find myself personally spending a significant amount of time both reading and posting comments. But so what, it was still worthwhile! Thank you very much for the positive feedback! Have a great rest of the week! Not at all…I would love to link up and grow!